Los Angeles, CA – [October 22, 2013] – Thought Development Corp., developer of the leading workflow management system for the media promotions industry, announced that Comedy Central, a wholly-owned unit of Viacom Inc. (NASDAQ: VIA and VIAB), has implemented the latest version of ON-AIR Pro™, expanding its utilization of the software with an eye for centralizing the tracking of additional types of off-air and digital marketing projects alongside the existing on-air promotions tracking. Comedy Central and Thought Development have enjoyed a longstanding relationship. In late 2001, Comedy Central deployed ON-AIR Pro™ to track project details and project costs across the organization’s numerous facilities, departments and resources. 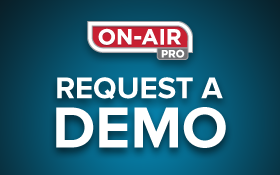 Over the years, both companies worked together to implement enhanced job costing, purchase ordering, and facility management capabilities within ON AIR Pro™, and it has been a foundational tool for the cable channel for over 10 productive years. Comedy Central, the #1 brand in comedy, is a top-rated network among men ages 18-24 and 18-34 and adults ages 18-49. With on-air, online and on-the-go mobile platforms, Comedy Central gives its audience access to the cutting-edge, laugh-out-loud world of comedy wherever they go. Hit series include Tosh.0, Workaholics, Key & Peele, Drunk History, Inside Amy Schumer, Kroll Show and the Emmy® and Peabody® Award-winning series South Park, The Daily Show with Jon Stewart and The Colbert Report. Comedy Central is also involved in producing nationwide stand-up tours, boasts its own record label and operates one of the most successful home entertainment divisions in the industry. For more information visit Comedy Central’s press Web site at www.cc.com/press or the network’s consumer site at www.cc.com and follow on Twitter @ComedyCentralPR for the latest in breaking news updates, behind-the-scenes information and photos. © Copyright 2013 Thought Development Corp.